OK this is something that happened to a friend. A year or two ago she bought a 'new Laptop' but quickly started to experience some issues with it e.g. screen freezing for no reason etc. Anyway, she went to the Dell Chat and spoke with a support technician called Gail. She gave her the model of her Dell Laptop and the Serial Number, and asked the question whether it was a brand new device or a restored/refurbished Laptop. The Dell Technician checked the Serial Number and confirmed it was a refurbished machine. She also explained what a refurbished machine actually means which was helpful. Either way my friend bought the Laptop off eBay and it was listed a New. In truth, she found out, it wasn't new, it was refurbished. After thinking about it she decided to contact the Seller. Fortunately they were very helpful and apologised for the misunderstanding. He sent her some device drivers which she installed, and the problems she was experiencing did not return. I think she found Dell Chat very helpful and I know she has used it several times since. She says the technicians go out of their way to help ans she has always received good answers to her questions. I think she is a bit of a Dell Chat fan now! Thank You Galenka for taking the time to write about your friends experience. 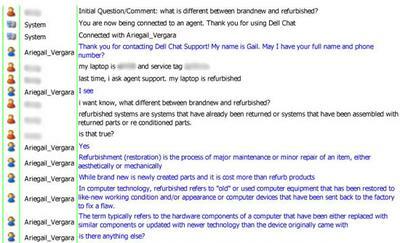 I have used Dell Chat (and the Support Forums before that) and always found the online technicians to be very helpful. However it is worth pointing out that Dell Chat technicians are entry level, which means any technical issues that are complex and go beyond basic troubleshooting need more detailed investigation. The Dell Chat Technician will refer you to another section of Dell where there are technicians with more in-depth knowledge of the device you are having trouble with. Is there any way to resolve this? Or do I have to replace with new one? I have a doubt when when my Laptop was repaired, whether the battery was changed. Is it possible to change the battery? How to know about that whether it is mine or not??? It is unusual for a new battery to be so depleted after 12 months of low use. Is your Laptop second hand? A classic symptom of a low battery is your system clock speeding up. See the Forgotten BIOS Password Reset Steps for steps on how to remove your battery (and replace). When I start my Laptop it sounds beep beep noisely. See the AMI BIOS page for Motherbard Beep sounds and what they mean. I have question for you.. and need quick and accurate answer.. I am using a Dell Inspiron 5050 model from last 4 years, but 2 days back one of my friends took my laptop for his work. After returning my laptop, whn I am using the battery, it is draining far too quickly, and I am having doubts about my friend. Maybe he changed the original battery from my laptop? If in case he changed original battery, how can I know exactly what happened? How do I find the original laptop in my battery? The Dell Inspiron n5050 is now over 4 years old. In that time standard use of your Laptop in battery mode will generate natural wear and tear which would explain your symptoms. It is most likely coincidence when your friendd borrowed your Laptop. A utility such as HW Monitor from CPUID will show you the state of your battery. Alternativley you could enter your Serial Number into the Dell web site and see if it gives you the serial number of the battery shipped with your Laptop. Ravi: Can you provide more information please? What O/S are you using? Could be lots of issues. Suspect a corrupt profile from your description but can't be sure at this time. Saicharen: This is a common Inspiron issue. The following steps tends to resolve in most instances. 3.Turn the laptop upside down, and remove the battery. 4. On the side where the mic and speaker sockets are, look for 2 or 3 screws that hold the drive in. 5. Remove these screws, and pull the hard drive (to the the side), then put it back re-seat). 7. Switch on and see if your issue is resolved. My Laptop is an Inspiron 1545. When I am switching on my laptop instead of loading the O/S, it is showing an error message as 'INTERNAL HARD DISK DRIVER NOT FOUND, TO RESOLVE THIS ISSUE TRY TO RESEAT THE DRIVER'. I do not understanding what to do. I don't have back up for my personal drives. So please suggest me to solve this problem. My desktop isn't switching on. Instead of loading the desktop, it is simply opening the home page and I cannot access to desktop anymore. Please provide me some solutions so that I could resolve my problem. It is not clear whether you are referring to your Operating System screen or your BIOS screen i.e. when you first switch on your Laptop as opposed to when your Laptop has booted up. I am assuming you are referring to your Operating System as I would expect the BIOS password to lock if entered incorrectly enough times. It also doesn't generally display a PIN number as such. If you are using Windows 10, check the following link to see what your options are for resetting your password. Sorry to hear about your Laptop issues. - Confirm there is no obvious damage to your adaptor pack. If there is unplug immediately and return to your supplier. I've seen the part your plug in to your Laptop be damaged inside, so it is not obvious. Check inside to make sure no small pins are bent or broken. With it being a new Laptop it is unlikely it has an out of date BIOS or any incorrect power settings enabled. Other issues include your Laptop battery. Try re-seating your Laptop battery. there are usually a couple of clips underneath your Laptop you need to pull back to enable you to slide your battery out of position. Make sure it is firmly in place and secure. As your Laptop is barely a month old please take it back to whoever your bought it from. You should have at least a 12 month warranty in place which means they should fix free of charge. I am having lots of problems with my Dell Laptop. My laptop model is Dell Inspiron 3148 Netbook. I get an "A.C. Adaptor not supportive" notification while switching it on. The Laptop battery discharges overnight while in shutdown mode, and won’t start again until I put on charge. While switching it on, I get rainbow lines, weird beep sounds, and a pop up window showing details about the parts of the laptop and properties of the A.C. Adaptor. Recently, I've received a hot temperature message, followed by a blinking of yellow lights a few times, then turning white, all in shutdown mode. My purchase has not even turned a month old. When I am starting my Dell Laptop it shows a password screen, but one day ago it showed a PIN number screen. I forgot the password but I know the PIN number. So how to bring back the PIN number screen in place of password screen? In short, yes you can upgrade a Dell Inspiron 15 3543 Laptop to 1 Tb Hard Drive (HDD). A quick check of the technical spec online suggests it is a SATA Hard Drive you need to buy. 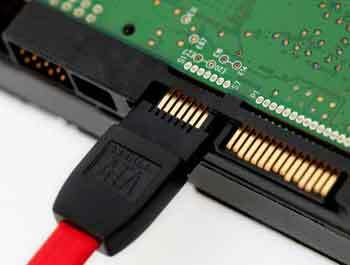 SATA stands for "Serial Advanced Technology Attachment". It looks like this in a standard PC. There is usually a cover on the bottom of the Laptop you screw off. The hard drive then usually clips out of the SATA connections (you may need to remove more screws). Rather than me explaining it in detail here, there are some excellent video's and information out there. Take a look at the video below, and the link which explains some of the things you should do first before removing the hard drive. My laptop is a Dell Inspiron 3543. Its hard disk is 500Gb. Can I upgrade it to 1TB? What are the procedures? How much it cost? Sorry to hear about your issues with your Dell Laptop. First thing to check is your warranty. If you are still covered contact Dell and ask for the issue(s) to be fixed. If you are not covered you can try taking it to your local computer repair shop for advice. Unfortunately flickering screens on Laptops are usually hardware-related - often the power supply cable or the inverter (the latter usually results in an almost blank screen). Sometimes the power cable gets damaged when you close/open your laptop screen, especially if not seated correctly or the cable itself does not run via its designated route. Sticky keys are a common issues on Laptops. Take a look at this video for an idea on how to fix yourself, although I would advise getting it fixed at the same time as your screen. Touchpad issues are often down to mouse settings. If you are on Windows 7 go to your control panel/mouse. Hopefully you have the right drivers installed and you can see the ELAD-Smart Pad Tab. Select this tab, then click the Options button, then the Advanced Tab. Here search for the PalmTracking option and amend the setting to Maximum. This makes sure your your pad does not react to inadvertent touches or swipes that can cause unexpected mouse actions on screen. Hi. My laptop is a Dell Vostro 5470. When I open any applications my screen keeps flashing. It does not work or just keeps working of its own accord. When I close it the screen becomes normal. It must be said that a few days earlier my laptop keyboard was giving me problems. The 'V' button keep pressing of its own accord. Also my Touch Pad also gives me problems in that it doesn't work properly. Join in and write your own page! It's easy to do. How? Simply click here to return to Dell Online Support.